Deposit £10 play £70 now! Editors note: Sky Casino have the biggest industry bonus when it comes to percentage – it’s a massive 600% bonus on your first deposit. All you’ve got to do is open an account and fund it with £10 to have a £60 bonus credited to your account instantly. All that for just a £10 deposit… it’s well worth checking them out. In spite of working with that impressive array of developers, however, Sky Casino does not boast by any means the largest selection of slot games around. At time of writing, in fact, there are between 50 and 100 slots offered via the desktop version of the sight and that represents fewer than half of what are offered elsewhere. What the Sky Casino selection does provide, though, is good variety. Amongst its slot game option, after all, are a good number of progressive jackpot games, both traditional and video slot games and game themed around all manner of TV shows and movies. Amongst those themed slots are the enduringly popular Marvel slot games developed by Playtech, as well as a multitude of others. Play slots now at Sky Casino & get your Deposit £10 play £70 bonus! The promotion run for brand new Sky Casino customers is arguably one of the most interesting around and comes in two parts. A newly registered customer whose first deposit is worth at least £10 can accept a bonus of £60 as the first part of that promotion. Their second deposit, meanwhile, can lead to a 100% matched deposit up to a maximum of £250. Visit skycasino.com on your PC, laptop, tablet or mobile device. Click, tap or otherwise select the small ‘Register’ link, appearing toward the top right hand corner of the page. Work through the registration form which will appear at the right hand side of the page, by following the on screen instructions. Once your account has been credited, make your first deposit and ensure that it is worth at least £10. Accept the £60 bonus when it is offered, and the funds will be immediately credited to your account. When you make a second deposit, ensure that it is worth at least £20. Accept the 100% matched second deposit when offered, and bonus funds worth 100% of your deposit – up to a maximum of £250 – will be immediately credited to your account. Get your Deposit £10 play £70 bonus now! The bonus is restricted to new registrations only. Existing Sky Casino, Sky Bet, Sky Poker and Sky Vegas customers are ineligible. In order to qualify for the first deposit bonus, a customer’s initial Sky Casino deposit must be worth at least £10. No matter the size of their deposit, the first deposit bonus is always worth £60. Customers must accept the bonus when offered, in order for the bonus funds to be credited to their account. Once they have accepted, bonus funds will be credited immediately. Before any withdrawal is possible, an amount equal to 100 times the bonus amount (£6000) must be wagered. 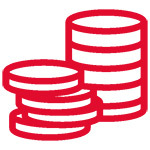 The maximum cash withdrawal related to use of the bonus funds is capped at £100. The above wagering requirements must be completed within 30 days of the bonus funds having been credited. If they are not, the bonus is void and any unused bonus funds, along with any and related winnings, will be removed from the customer’s account. Slots contribute 100% toward the wagering requirements, whilst all card and table games contribute just 20%. Customers resident in Northern Ireland must call Sky Casino customer services in order to receive their £60 bonus. They will be requested to provide a valid copy of photo ID, as well as a bank statement or utility bill from the past three months. Documentation must be provided within 72 hours of making a qualifying deposit. The minimum deposit which will trigger the second deposit 100% matched bonus is £20. The maximum bonus amount is £250. Customers must accept the 100% matched second deposit bonus when offered. Before any withdrawal is possible, an amount equal to 30 times the deposit AND bonus amount must be wagered. Those wagering requirements must be completed within 30 days of the bonus funds having been credited. If the requirements are not fulfilled within 30 days, the bonus is void and all unused funds and related winnings will be forfeit. Slots contribute 100% towards the above wagering requirements, roulette contributes 20% and blackjack contributes 10%. Those casino game fans who like to play on the move via their mobile devices have a couple of different options when it comes to Sky Casino. Users of any type of device can access Sky Casino’s HTML5 based mobile offering simply by visiting the site through their web browser. There are, however, also downloadable apps for both Android and iOS controlled smartphones and tablets. First and foremost, the Sky Casino mobile app is a very attractive one. It has a stylish and high end look about it, which reflects the impression that the company try to convey through their service. Fortunately, when it comes to their mobile offering, the quality doesn’t extend only to appearance. The app, too, is impressively user friendly, is very easy to navigate and benefits from smooth gameplay not found through many mobile apps. 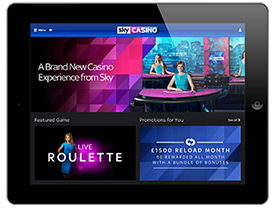 Sky’s live casino offering is also easily accessible through the app and combines well with the more traditional game offerings to round out a generally impressive mobile site. Whilst the Sky Casino mobile app will keep most players happy, there are a couple of notable downsides which will upset some. The overall number of different games offered, for instance, falls some way short of that provided by the apps of other major providers. The fact, too, that Sky don’t offer a combined app for their sportsbook, bingo, poker and casino services may disappoint those players who like to vary their gambling diets. Get app & Deposit £10 play £70 bonus now! A good way to assess how good an online casino is by first looking at how the approach customer support, and what options are afforded to customers. As you may expect from an online casino run by a huge company like BskyB, the customer support at Sky Casino is very good. Initially, a customer or player with a question or problem can seek their solution from Sky Casino’s online support centre. That support centre can be launched in just one click or tap from any page of the Sky Casino website and is populated with loads of helpful information. That information includes both long-form help articles and frequently asked questions, and encompasses topics such as account suspension, login problems, technical support and loads more besides. If the support centre doesn’t provide a sufficient answer to a query, however, Sky Casino customers can also contact the company’s customer service staff in a number of ways. An online live chat feature is included as part of the Sky Casino site and whilst addresses are not provided emails can also be sent through an imbedded tool. For more traditional support, too, a helpline is available to call between 8 am and midnight every day. Sky Casino is operated by a company called Bonne Terre Limited, which is registered in Alderney. That company’s registered office can be found at the following address; Office 1, 1 The Crusher, Braye Harbour, Alderney, GYA 3XX. When providing casino services to customers based in the UK, the company is licensed (licence number 038718) and regulated by the Great Britain Gambling Commission. When serving customers elsewhere, the company is licensed and regulated by the Alderney Gambling Control Commission. Aside from that official regulation, another sign of Sky Casino’s security and fairness is that they are a registered IBAS operator. That means that they are signed up to allow customers to seek third party adjudication in the case of a dispute from the Independent Betting Adjudication Service. All data transfers managed and financial information held by Sky Casino, too, benefits from industry standard 128-bit SSL encryption. It is clear from their branding and the appearance of their website that Sky Casino pitch themselves as a more high-end online casino. In some ways their service does reflect that position but, unfortunately, there are other areas where the provider doesn’t compare so well with their main competitors. Both Sky Casino’s desktop and mobile offerings are undoubtedly attractive and boasts impressive graphics and excellent gameplay. The number of games which are available, however, disappoints in comparison to the breadth of choice provided for elsewhere. Sky Casino’s welcome offer, too, is one which at face value is quite generous but is unfortunately subject to some of the harshest wagering requirements you will find anywhere. In many ways, therefore, Sky Casino’s offering is something of a game of two halves to borrow a footballing parlance.